It will be tough for you to stand still containing the excitement you'll have while wearing the Mens Deluxe Scarecrow Adult Costume. This classic costume comes with a hat, pants, and a top. The top the this costume is brown, with grey and red patches printed randomly across the body. The same colors are featured on the attached belt to the costume. The long sleeves are tied by matching ribbon before it reaches the straw fringing that is also located on the hem of the shirt and the neckline. The pants match the shirt and feature the same ribbons and straw fringing. 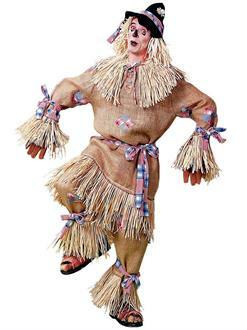 The pointed hat is black and will be a great finish for this scarecrow costume. Wear this to a Wizard of Oz theme party or just any costume party to show off this amazingly detailed costume. You won't pull the short straw with this costume.